Face of a boy with ataxia-telangiectasia. Apparent ocular telangiectasia. Syllaba and Henner first published descriptions of patients with ataxia-telangiectasia in 1926. They observed progressive choreoathetosis and ocular telangiectasia in 3 members of a single family. A gap of some 15 years occurred before the next report in 1941 by Louis-Bar, who described progressive cerebellar ataxia and cutaneous telangiectasia in a Belgian child. The syndrome subsequently received the name of Louis-Bar. Ataxia-telangiectasia was not described as a distinct clinical entity for another 16 years until Boder and Sedgwick  in 1957 and Biemond  in 1957, with the aid of autopsies, reported organ developmental abnormalities; neurologic manifestations; and a third major feature of the disease, recurrent sinopulmonary infection. Ataxia-telangiectasia can best be classified, according to its major clinical and pathologic features, as a predominantly cerebellar form of spinocerebellar degeneration, which is transmitted as an autosomal recessive trait and evolves ultimately to include motor neuron disease, with spinal muscular atrophy and peripheral neuropathy. Ataxia-telangiectasia can also be classified among the neurocutaneous syndromes, although not among the phakomatoses as originally proposed, because the vascular and cutaneous lesions of ataxia-telangiectasia are not congenital nevi but develop in the course of the disease as a progeric manifestation. Ataxia-telangiectasia should be considered among the immunodeficiency diseases, cancer-prone genetic disorders, chromosomal instability syndromes, disorders with abnormal radiosensitivity, syndromes with possible DNA-repair/processing defects, and (as is now evident) the progeroid syndromes. Also see Ataxia-Telangiectasia in Ophthalmology. One basic defect associated with the malady is the abnormal sensitivity of ataxia-telangiectasia cells to x-rays and certain radiomimetic chemicals but not to ultraviolet irradiation, which leads to chromosome and chromatid breaks. Breakpoints are randomly distributed, but nonrandom chromosome rearrangements selectively affect chromosomes 7 and 14 at sites that are concerned with T-cell receptors and heavy-chain immunoglobulin coding and with the development of hematologic malignancies. Such disturbances could account for the frequency of infections and neoplasias. As has been shown by Guerra-Maranhao et al, ataxia-telangiectasia patients are at high risk of having impaired responses to infection with pneumococci, which may be one of the causes of recurrent sinopulmonary infections in these patients. The authors analyzed the production of antibodies to polysaccharide antigens in patients with ataxia-telangiectasia and found that the levels of immunoglobulin G (IgG) antibodies to serotypes 1, 3, 5, 6B, 9V, and 14 of Streptococcus pneumoniae before and after immunization with 23-valent polysaccharide vaccine were significantly lower than in a healthy population. The mechanisms responsible for neurologic disease, thymus aplasia, telangiectasias, growth retardation, and impaired organ mutation have not been elucidated, but most likely, they are linked to accelerated telomere loss. [15, 16] ATM has been shown to be pivotal for neurodevelopment, especially for stem cell differentiation, as well as for elimination of damaged postmitotic cells. Frappart and McKinnon showed that the ATM protein has a proapoptotic function in the developing mouse CNS, acting in cooperation with another key proapoptotic factor—Bax protein. ATM-dependent apoptosis occurred only in postmitotic populations of neurons after irradiation. These results suggest that ATM may serve to eliminate neurons with excessive DNA damage during CNS development. A general disturbance in tissue differentiation accounts for the almost constant elevation of alpha-fetoprotein (AFP), a fetal serum protein of hepatic origin that indicates dedifferentiation of liver cells. Research suggests that ataxia-telangiectasia may be associated with dysregulation of the immunoglobulin gene superfamily, which includes genes for T-cell receptors. The normal switch from the production of immunoglobulin M (IgM) to IgG, immunoglobulin A (IgA), and immunoglobulin E (IgE) is defective, and the same may apply to the switch from immature T cells that express the gamma/delta rather than the alpha/beta receptors. Conceivably, an absence or a mutation of a single protein coded for by chromosome 11 could explain the immunologic and perhaps even the neurologic features of the disease. The ATM protein apparently controls the cell cycle and plays a major role in the protection of the genome. The ataxia-telangiectasia gene has been localized to band 11q22-23. The gene, called ATM (ataxia-telangiectasia mutated), is a member of a family of phosphatidylinositol-3-kinase–related genes involved in cell cycle control, intracellular protein transport, and DNA damage response. Little correlation exists between the level of ATM protein and the type of underlying mutation, clinical phenotype, or radiophenotype. The discovery of this gene has also led to phenotypic spectrum expansion. Also see Laboratory Studies. Ataxia-telangiectasia is reported in all races, although the mortality ratios differ between the ethnic groups. Ataxia-telangiectasia occurs equally among males and females. No characteristic features are detectable during very early childhood. 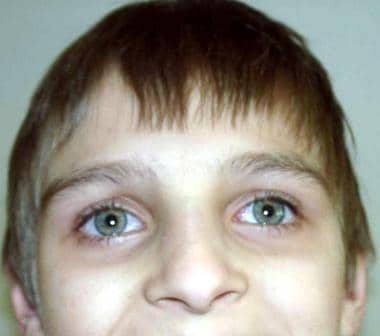 Oculocutaneous telangiectasia, the second diagnostic hallmark of ataxia-telangiectasia, usually has a later onset than the ataxia, typically at age 3-6 years. The progression of the disease is apparent in subsequent years. The neurologic features of ataxia-telangiectasia are relentlessly progressive. In addition to the classic early features, older patients tend to develop other signs of spinocerebellar degeneration (eg, posterior cord involvement with loss of the deep tendon reflexes, spinal muscular atrophy). Most patients are wheelchair dependent by age 10-15 years, but mild forms are not rare. The lifetime risk of cancer among patients with ataxia-telangiectasia has been estimated to be 10-38%, [31, 32, 33] which is about 100-fold more than the population rate  ; however, in the absence of chronic bronchopulmonary disease and lymphoreticular malignancy, ataxia-telangiectasia is consistent with survival into the fifth or sixth decade. Good patient and parental education should include tactful genetic counseling and an explanation of the multisystem nature of the disease. Pay special attention to the susceptibility of adult members of families with ataxia-telangiectasia to malignant neoplasms and to the importance of regular examinations for early cancer detection. Ziv Y, Rotman G, Frydman M, Dagan J, Cohen T, Foroud T, et al. The ATC (ataxia-telangiectasia complementation group C) locus localizes to 11q22-q23. Genomics. 1991 Feb. 9(2):373-5. [Medline]. Soresina A, Meini A, Lougaris V, Cattaneo G, Pellegrino S, Piane M, et al. Different clinical and immunological presentation of ataxia-telangiectasia within the same family. Neuropediatrics. 2008 Feb. 39(1):43-5. [Medline]. Syllaba L, Henner K. Contribution a l'independance de l'athetose double idiopathique et congenitale. Rev Neurol (Paris). 1926. 1:541-62. Louis-Bar D. Sur syndrome progressif comprenant des telangiectasies capillaires cutanees et conjonctivales symetriques, a disposition naevoide et de troubles cerebelleux. Confin Neurol (Basel). 1941. 4:32-42. Sedgwick RP, Boder E. Progressive ataxia in childhood with particular reference to ataxia-telangiectasia. Neurology. 1960 Jul. 10:705-15. [Medline]. Biemond A. Paleocerebellar atrophy with extrapyramidal manifestations in association with bronchiectasis and telangiectasis of the conjunctiva bulbi as a familial syndrome. van Bogaert L, Radermecker J, eds. Proceedings of the First International Congress. 1957. 206. Azarsiz E, Karaca NE, Gunaydin NC, Gulez N, Ozturk C, Aksu G, et al. Do elevated serum IgM levels have to be included in probable diagnosis criteria of patients with ataxia-telangiectasia?. Int J Immunopathol Pharmacol. 2014 Jul-Sep. 27(3):421-427. [Medline]. Biton S, Barzilai A, Shiloh Y. The neurological phenotype of ataxia-telangiectasia: solving a persistent puzzle. DNA Repair (Amst). 2008 Jul 1. 7(7):1028-38. [Medline]. Zhan H, Suzuki T, Aizawa K, Miyagawa K, Nagai R. Ataxia telangiectasia mutated (ATM)-mediated DNA damage response in oxidative stress-induced vascular endothelial cell senescence. J Biol Chem. 2010 Sep 17. 285(38):29662-70. [Medline]. [Full Text]. Verhagen MM, Last JI, Hogervorst FB, Smeets DF, Roeleveld N, Verheijen F, et al. Presence of ATM protein and residual kinase activity correlates with the phenotype in ataxia-telangiectasia: A genotype - phenotype study. Hum Mutat. 2011 Dec 29. [Medline]. Guerra-Maranhao MC, Costa-Carvalho BT, Nudelman V, Barros-Nunes P, Carneiro-Sampaio MM, Arslanian C, et al. Response to polysaccharide antigens in patients with ataxia-telangiectasia. J Pediatr (Rio J). 2006 Mar-Apr. 82(2):132-6. [Medline]. Lee KM, Choi JY, Park SK, Chung HW, Ahn B, Yoo KY, et al. Genetic polymorphisms of ataxia telangiectasia mutated and breast cancer risk. Cancer Epidemiol Biomarkers Prev. 2005 Apr. 14(4):821-5. [Medline]. Byrd PJ, Srinivasan V, Last JI, Smith A, Biggs P, Carney EF, et al. Severe reaction to radiotherapy for breast cancer as the presenting feature of ataxia telangiectasia. Br J Cancer. 2011 Dec 6. [Medline]. Xing J, Wu X, Vaporciyan AA, Spitz MR, Gu J. Prognostic significance of ataxia-telangiectasia mutated, DNA-dependent protein kinase catalytic subunit, and Ku heterodimeric regulatory complex 86-kD subunit expression in patients with nonsmall cell lung cancer. Cancer. 2008 Jun 15. 112(12):2756-64. [Medline]. Senior K. DNA damage mechanisms in ataxia telangiectasia. Lancet Neurol. 2003. 2(3):139. Qi L, Strong MA, Karim BO, Armanios M, Huso DL, Greider CW. Short telomeres and ataxia-telangiectasia mutated deficiency cooperatively increase telomere dysfunction and suppress tumorigenesis. Cancer Res. 2003 Dec 1. 63(23):8188-96. [Medline]. Lee Y, Chong MJ, McKinnon PJ. Ataxia telangiectasia mutated-dependent apoptosis after genotoxic stress in the developing nervous system is determined by cellular differentiation status. J Neurosci. 2001 Sep 1. 21(17):6687-93. [Medline]. Frappart PO, McKinnon PJ. Mouse models of DNA double-strand break repair and neurological disease. DNA Repair (Amst). 2008 Jul 1. 7(7):1051-60. [Medline]. Edwin Shackelford R, Manuszak RP, Heard SC, Link CJ, Wang S. Pharmacological manipulation of ataxia-telangiectasia kinase activity as a treatment for Parkinson's disease. Med Hypotheses. 2005. 64(4):736-41. [Medline]. Chen Z, Ye W, Long Z, Ding D, Peng H, Hou X, et al. Targeted Next-Generation Sequencing Revealed Novel Mutations in Chinese Ataxia Telangiectasia Patients: A Precision Medicine Perspective. PLoS One. 2015. 10 (10):e0139738. [Medline]. Swift M, Morrell D, Cromartie E, Chamberlin AR, Skolnick MH, Bishop DT. The incidence and gene frequency of ataxia-telangiectasia in the United States. Am J Hum Genet. 1986 Nov. 39(5):573-83. [Medline]. Su Y, Swift M. Mortality rates among carriers of ataxia-telangiectasia mutant alleles. Ann Intern Med. 2000 Nov 21. 133(10):770-8. [Medline]. Broides A, Nahum A, Mandola AB, Rozner L, Pinsk V, Ling G, et al. Incidence of typically Severe Primary Immunodeficiency Diseases in Consanguineous and Non-consanguineous Populations. J Clin Immunol. 2017 Apr. 37 (3):295-300. [Medline]. Trimis GG, Athanassaki CK, Kanariou MM, Giannoulia-Karantana AA. Unusual absence of neurologic symptoms in a six-year old girl with ataxia-telangiectasia. J Postgrad Med. 2004 Oct-Dec. 50(4):270-1. [Medline]. Chaudhary MW, Al-Baradie RS. Ataxia-telangiectasia: future prospects. Appl Clin Genet. 2014. 7:159-67. [Medline]. [Full Text]. Hersby DS, Sehested A, Kristensen K, Schmiegelow K. T-cell ALL in Ataxia Telangiectasia Cured With Only 7 Weeks of Anti-leukemic Therapy. J Pediatr Hematol Oncol. 2014 Mar 21. [Medline]. Opeskin K, Waterston J, Nirenberg A, Hare WS. Ataxia telangiectasia with long survival. J Clin Neurosci. 1998 Oct. 5(4):471-3. [Medline]. Morrell D, Cromartie E, Swift M. Mortality and cancer incidence in 263 patients with ataxia-telangiectasia. J Natl Cancer Inst. 1986 Jul. 77(1):89-92. [Medline]. Boder E. Ataxia-Telangiectasia. Gomez MR, ed. Neurocutaneous Diseases: A Practical Approach. Boston, Mass: Butterworth-Heinemann; 1987. 95-117. Olsen JH, Hahnemann JM, Borresen-Dale AL, Brondum-Nielsen K, Hammarstrom L, Kleinerman R, et al. Cancer in patients with ataxia-telangiectasia and in their relatives in the nordic countries. J Natl Cancer Inst. 2001 Jan 17. 93(2):121-7. [Medline]. Morrell D, Chase CL, Swift M. Cancers in 44 families with ataxia-telangiectasia. Cancer Genet Cytogenet. 1990 Nov 1. 50(1):119-23. [Medline]. Spector BD, Filipovich AH, Perry GS, et al. Epidemiology of cancer in ataxia-telangiectasia. Bridges BA, Harnden DG, eds. Ataxia-Telangiectasia: A Cellular and Molecular Link Between Cancer, Neuropathology, and Immune Deficiency. New York, NY: Wiley; 1982. 103-37. Carrillo F, Schneider SA, Taylor AM, Srinivasan V, Kapoor R, Bhatia KP. Prominent Oromandibular Dystonia and Pharyngeal Telangiectasia in Atypical Ataxia Telangiectasia. Cerebellum. 2008 Oct 10. [Medline]. Shiloh Y, Lederman HM. Ataxia-telangiectasia (A-T): An emerging dimension of premature ageing. Ageing Res Rev. 2016 May 12. [Medline]. Privette ED, Ram G, Treat JR, Yan AC, Heimall JR. Healing of granulomatous skin changes in ataxia-telangiectasia after treatment with intravenous immunoglobulin and topical mometasone 0.1% ointment. Pediatr Dermatol. 2014 Nov-Dec. 31 (6):703-7. [Medline]. Leclerc-Mercier S, Moshous D, Neven B, Mahlaoui N, Martin L, Pellier I, et al. Cutaneous granulomas with primary immunodeficiency in children: a report of 17 new patients and a review of the literature. J Eur Acad Dermatol Venereol. 2019 Mar 14. [Medline]. Buchbinder D, Hauck F, Albert MH, Rack A, Bakhtiar S, Shcherbina A, et al. Rubella Virus-Associated Cutaneous Granulomatous Disease: a Unique Complication in Immune-Deficient Patients, Not Limited to DNA Repair Disorders. J Clin Immunol. 2019 Jan. 39 (1):81-89. [Medline]. Sandoval C, Swift M. Hodgkin disease in ataxia-telangiectasia patients with poor outcomes. Med Pediatr Oncol. 2003 Mar. 40(3):162-6. [Medline]. Hecht F, Hecht BK. Cancer in ataxia-telangiectasia patients. Cancer Genet Cytogenet. 1990 May. 46(1):9-19. [Medline]. Sandoval C, Schantz S, Posey D, Swift M. Parotid and thyroid gland cancers in patients with ataxia-telangiectasia. Pediatr Hematol Oncol. 2001 Dec. 18(8):485-90. [Medline]. Swift M, Morrell D, Massey RB, Chase CL. Incidence of cancer in 161 families affected by ataxia-telangiectasia. N Engl J Med. 1991 Dec 26. 325(26):1831-6. [Medline]. Habek M, Brinar VV, Rados M, Zadro I, Zarkovic K. Brain MRI abnormalities in ataxia-telangiectasia. Neurologist. 2008 May. 14(3):192-5. [Medline]. Kim JH, Kim H, Lee KY, Choe KH, Ryu JS, Yoon HI, et al. Genetic polymorphisms of ataxia telangiectasia mutated affect lung cancer risk. Hum Mol Genet. 2006 Apr 1. 15(7):1181-6. [Medline]. Cantarutti N, Claps A, Angelino G, Chessa L, Callea F, El Hachem M, et al. Multi-drugs resistant acne rosacea in a child affected by Ataxia-Telangiectasia: successful treatment with Isotretinoin. Ital J Pediatr. 2015 Mar 28. 41:23. [Medline]. Tavani F, Zimmerman RA, Berry GT, Sullivan K, Gatti R, Bingham P. Ataxia-telangiectasia: the pattern of cerebellar atrophy on MRI. Neuroradiology. 2003 May. 45(5):315-9. [Medline]. Sandoval C, Swift M. Treatment of lymphoid malignancies in patients with ataxia-telangiectasia. Med Pediatr Oncol. 1998 Dec. 31(6):491-7. [Medline]. Seidemann K, Henze G, Beck JD, Sauerbrey A, Kühl J, Mann G, et al. Non-Hodgkin's lymphoma in pediatric patients with chromosomal breakage syndromes (AT and NBS): experience from the BFM trials. Ann Oncol. 2000. 11 Suppl 1:141-5. [Medline]. Shackelford RE, Manuszak RP, Johnson CD, Hellrung DJ, Steele TA, Link CJ, et al. Desferrioxamine treatment increases the genomic stability of Ataxia-telangiectasia cells. DNA Repair (Amst). 2003 Sep 18. 2(9):971-81. [Medline]. Lavin MF, Gueven N, Bottle S, Gatti RA. Current and potential therapeutic strategies for the treatment of ataxia-telangiectasia. Br Med Bull. 2007. 81-82:129-47. [Medline]. Close-up view of advanced telangiectasia of the bulbar conjunctiva. Chest MRI showing a hyperintense lesion in the right mediastinum corresponding to lymphoma.